How have I gone 28 years without seeing The Thing? Apparently every single one of my friends has, since it was recommended by Kyle, Steve, and Will for this month's line-up. This was a great movie. John Carpenter isn't putting out as many movies as he used to, but when he was in his most active years, he turned out some of modern horror's most defining titles. Prince of Darkness is still a real favorite of mine, and his episode of Masters of Horror ("Cigarette Burns") was my favorite installment of that series. I included this as the kick-off of my Creepy Creatures block of movies, and it definitely fits that category, but what made this movie truly great for me was not the monster, but the human interactions. The story centers around a group of men stationed at a remote, isolated Antarctic research station. Their communications with the outside world have been interrupted for several weeks. A helicopter from the neighboring Norwegian station comes roaring into their space, piloted by a lone man who is trying to kill a fleeing dog. It turns out that the dog is host to a creature that can absorb, and then take the form of, any living thing. As the Thing spreads through the station, the mistrust and paranoia among the crew builds and builds, and this is what made the movie truly interesting for me. My favorite scene is the one that is probably also the movie's most famous one, when the men are testing the blood samples to see which one is contaminated. Even though I knew how this scene played out, and I knew what was coming, it still got me! It's a great scene! I give The Thing five flamethrowers out of five. Oh man, Danny. I'm so glad you included this film. I haven't seen it in years, but when I was young it was absolutely one of my favorite movies. Funny story, I originally saw this movie (and recorded it) on network TV. I watched it over and over again, but you can imagine how edited it was for broadcast. The scene you mention above (also one of my favorites) was more or less cut to the bone so that the "chest mouth" and "spider head" were never even shown. When I finally saw it uncut, it was like watching a totally different movie. I couldn't believe how much better the movie was! I love that. It's like you got the DVD extended directors cut with deleted scenes just by seeing the actual movie. Brilliant, brilliant movie. And you're right -- it works not just because of the amazing effects work but because it shifts the anxiety from the weird, morphing monsters onto the characters/actors themselves, leading for example to the classic end of Russell and Keith David staring each other down. The blood-testing scene is hilarious and incredible. Top notch movie, simply one of the great horror films ever, IMO. Have you ever seen The Fog? Nice little ghost story. I haven't seen that one - I'll have to check it out. It's not as good as The Thing, but doesn't aspire to be. It's nicely done and has a good, creepy, ghostly feel to it. A good early Carpenter flick. 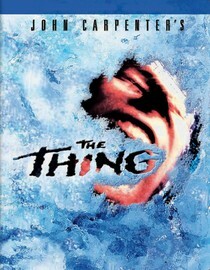 My first R-rated movie, my Dad took me to see The Thing (1982) when I was 12. I didn't see the climactic battle until years afterward because I dove under the seats in front of us and only peeked out when the noise died down, just in time to catch the iconic Russel-David staredown. Happy you added it to the rotation and more certain of our friendship than ever that you liked it as much as you did. P.S. Haven't seen Carpenter's The Fog, but Darabont's adaptation of Stephen King's The Fog is pretty good. On the DVD you have the option to watch it in black and white, as if it were the kind of 50s genre picture it's emulating. Having seen it in color and B&W I'd recommend you, a time-strapped Dad who doesn't have time for dilly-dallying, go right for the B&W. It's a creature feature-slash-evil that men do picture, so there's still time if you have a slot that's not solid. To correct Will above, the film (and King novella) is called The Mist. And I agree, very good film. It's a tough call whether to go with the B&W and or color. Darabont said that he always wanted to do the film in B&W but the studio basically pressured him into going with color because they didn't think anybody would see a B&W movie. So if you want to see the theatrical release, go color, if you want to see the director's original vision go B&W. I think they both have their own pros and cons and unfortunately, you can only see it for the first time once. Oh, OK - I've read that novella, but haven't seen either adaptation. I'm drawn to the B&W cut for a first viewing.